A number of events since the last newsletter have concerned sites away from our established reserves. In April Stanmore Little Common joined our portfolio of sites. This is the small but very attractive green space around the two Spring Ponds north of Wood Lane, which together with the adjacent mixture of houses and cottages forms an area with a rural, village green ambience. Robert Stone robertlstone@gmail.com, who lives in one of those houses, has taken on the wardenship. Councillor Tony Ferrari, chairman of the Conservators of Harrow Weald Common, has spearheaded a drive to involve the public in policymaking and management for that site. Sadly, no one has been found to take on the wardenship, which means that day to day management remains the responsibility of the council, in particular Anna Cohen and Dave Corby – both of whom have their hands full elsewhere. This is a real opportunity for someone who has an interest in nature conservation to influence the future of a significant wild area in Harrow, so if you are tempted and would like to talk about the possibilities contact the Forum or Tony Ferrari tony_ferrari@btopenworld.com. Tony Bernie, who lives on one of the cottages on the Common, has agreed to report to us about what is happening on this important site. Meanwhile there is hopeful progress and hopeful signs in regard of environmental and ecological centres. In the south of the borough the Earth Project at Newton Farm is up and running, headed by Andy Carter of the Harrow Skills Centre. The Earth Centre includes a classroom, a large greenhouse, raised beds and linear plots, and teaches horticulture and related skills. Andy’s plans for the future include an area with small animals such as chickens and rabbits, which visiting schoolchildren would no doubt love, and courses on how to install some forms of alternative energy generation. In parallel he hopes to improve the nearby Newton Farm open space and use it as a site to show children some aspects of nature, such as pond wildlife. As part of this project a team from the Forum is now surveying the site to see what is there and what could be done to improve its biological value. Meanwhile a dedicated team is fighting on for the concept that an ecology centre be established on the boundary of Bentley Priory nature reserve, either as part of the educational and museum complex planned for Bentley Priory, or within Bentley Wood school. Councillor Camilla Bath has confirmed that there is already £100,000 earmarked for this project from the section 106 monies generated by the housing development on the old Marconi site besides Stanmore Common (now called Bentley Grove) while the public consultation on the fate of the Bentley Priory Ministry of Defense site specifically raised the idea of an ecology centre either within the historic house or as a separate building. At present local schoolchildren are bussed to sites outside Harrow for field trips because of the lack of suitable facilities in the borough. Provision of an ecology centre adjoining Bentley Priory reserve will allow children from all over the borough to see what is one of Harrow’s loveliest wild areas, which in turn will I hope lead them to feel a greater ownership of and responsibility for the undeveloped spaces within this densely built up part of London. Sarah Kersey of Agenda 21 is leading the drive to create this centre. Although individual volunteers willing to make a long term commitment to a site are rare and therefore especially valued, we are also grateful to those who give up a few hours to work on our sites. 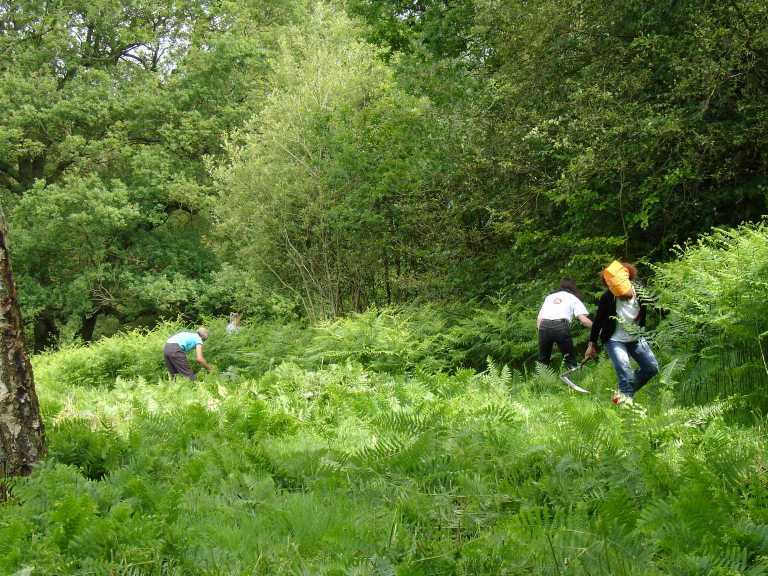 In March Stanmore Common was the venue for a short but intense period of work by about fifty young people from the Chinmaya Mission, a Hindu youth group. One of the tasks they performed was to plant heather seeds in the area cleared for that purpose as part of the London Heathland Heritage Project – so we will now watch the ground in hope and expectation of young sprouts. The visit was organized by Lucca Leadership, and Simon Braidman is in contact with them with the aim of bringing other groups onto the site. I have recently been approached by two different organizations involved in placing groups of adults on our sites for short bouts of work. In each case their employer releases the workers, on full pay, to do community work. One such firm is G. E. Money, based in Croxley Green – so we owe them a big thank you. We have arranged working parties for June and July at Pear Wood and Stanmore Country Park. Volunteers from G.E. Money hard at work at Stanmore Common on a beautiful June day (June 13th 2008). Betty Brown received the following from Judy Adams, Chief Executive of the Herts & Middx Wildlife Trust. Thank you for letting me know of the funeral of Maurice Pickering. I’m sorry we were unable to attend. He did an amazing amount of work in Harrow, both for the local group and as the founder of the Conservation Forum. Please pass on our gratitude for his exceptional work on behalf of nature conservation in Harrow. The winter work is now complete. We have reached the season of events and walks to enjoy our progress and appreciate the resident wildlife. However bracken and bramble removal continues throughout the summer, weather permitting. The Spring walk was well attended and 7 people turned up for the May moth evening. This produced fourteen species including two new records for the Park; three Nut Tree Tussocks and a Least Black Arches. This last moth had to be identified by the County Recorder, Colin Plant. As I write work has commenced on the new car park off of Dennis Lane. It was suggested Stanmore Country Park would be a suitable location for an owl box. Betty Brown reported that here was a good display of bluebells and wood anemones. Further volunteers would be welcome following the reduction of voluntary effort at the site. Betty also reported that over their 21 years as a nature reserve there had been highs and lows. They would be celebrating at their AGM on the 14th May at 7.45pm and Nancy Jenkins a local historian would be talking about the history of the Vicarage. They would like to produce a new leaflet this year. Jill Lewis reported that there had been a very good spring display not only of primroses and cowslips but a good range of other species as well. Plans to build more hard standing at the back of the church have meant that some Solomon’s Seal and ferns have had to be replaced. The Vicar at the church is interested and sympathetic towards wildlife and more paths through the wild areas are planned. The litter is a problem. It was agreed that Dave Corby would organise the delivery and collection of a blue bin for recyclable waste. Phil Attewell, Rosemary Etheridge and Claire Abbott have relocated two nests of ants from the Royal National Orthopaedic Hospital on the 10th April; they were still feeding them. Ten bird boxes have been put up several of which are already occupied. Male and female Mandarin ducks have been seen. A meeting had been arranged with a bat specialist and they will take advice on the issue of lighting from the driving range. The ongoing vandalism and fire starting was a problem. It has been reported to the Canon’s Police Team but it is difficult as it is in the middle of the wood. The situation will be monitored. The problem of sewage seepage had been reported on 14th March. On inspection it was found that the pumps were broken and it was indicated that something would be done within two weeks As nothing happened the issue was reported to the Estates Manger on 28th April. It was agreed that Dave Corby would look into the situation. Herts and Middlesex Wildlife Trust have been contacted about returning to clear up following their earlier visit. It was agreed to think about encouraging greater use of the Scout and Guide fields. Robert Stone was welcomed as the voluntary warden for Stanmore Little Common. He reported that there was a lot of litter some of which appeared to be linked to the Rugby club and the Mosque. He also expressed concern about horse riding on footpaths. As this is against the by-laws it was agreed that Simon Braidman and Roger Stone would email a note to Dave Corby which he would put on headed note paper which could then be circulated to the horse riding establishments. It was noted that care needed to be taken to protect the Mandarin ducks who regularly use a hole in a tree to nest. It was also agreed to look out for turtles. Simon Braidman has the contact details for removing them to a more appropriate location. Peter Peretti proposed that he take a group around the site to see the clearing that has taken place through the Council thanks to Anna Cohen and Dave Corby. It was agreed that a visit would take place on Sunday May25th at 2pm meeting at the entrance in Old Lodge Way. A pair of swans was nesting on Summerhouse lake for the first time; a pair of grebes was also nesting. Up to fifty redwings had been seen earlier in the year. 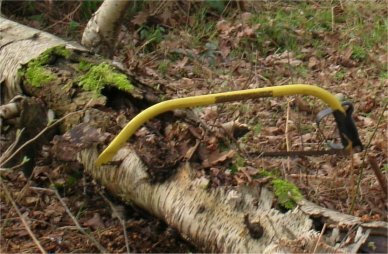 Winter work has included cutting down nettles, clearing ditches, repairing paths, keeping willows in check and general litter clearance. Also information boards have been kept clean. However the idea of wheelchair access may turn this wildlife area into an extension of the nearby park. The new post and rails have been fitted. Work days have been planned for the coming months. Simon Braidman reported that as well as the successful Lucca Foundation event one more working party/walk had taken place which was not very well attended. The litter problem had improved. Dave Corby reported that that he had reorganised the litter picking in the area. The picnic tables and benches had rotted and needed replacing. They were not usable at the moment and are not an asset to the area.